DIGMALL Bluetooth V4.1 Audio Transmitter/Receiver, it features the most premium CSR8670, which makes it a very handy device for those who want to get away from wires, Match Your Smart Life. 【Transmitter Mode(TX)】: Make your TV or PC into Bluetooth-enabled to pair Bluetooth headphones/Speakers. 【Receiver Mode(RX)】: Turn your wired speaker or headphones into wireless and paired to your smartphone/iPad. Simply connect the transmitter to the audio output port of your TV, iPod, or wired headphones/old speakers via the 3.5mm/RCA audio cable to transfer sound wirelessly via Bluetooth. With the latest apt-X Low Latency (LL), let you stream your favorite movies, games and late TV shows lag-free. Uncompromised sound, apt-X LL audio coding delivers real-time streaming high quality stereo audio. Enjoy premium CD-quality audio experience without the nuisance of wires. Supporting pairing two headphones / speakers simultaneously, you can watch mid-night TV shows or listen to music without disturbing others. Connect BTI-018 to a USB charger, and stream the audio as long as you can. 1.The latency of 40ms is still unacceptable for live sound monitoring. Therefore, musicians beware! 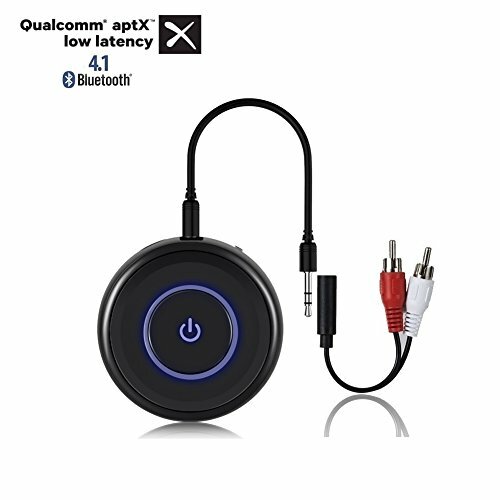 Bluetooth technology, even with aptX LL, may not suit your needs. 【Dual Wireless Audio Streaming】- The DIGMALL Portable Bluetooth 4.1 Transmitter and Receiver BTI-018 connect via 3.5mm or RCA and streams audio to your Bluetooth headphones or speakers in TX mode. Set it to RX mode to wirelessly receive audio from iphone smartphones, iPad or computer in car or home sound system. 【Artfully Synchronized Audio with aptX-LL】- Lip-sync delay is the archenemy of all Bluetooth adapters. But fret not! DIGMALL has equipped the Bluetooth 4.1 Transmitter with an apt-X Low Latency audio codec for a real-time sound transmission when playing games or watching movies in TX mode. 【Connects to 2 Devices】- Unlike those Bluetooth adapters that can communicate with just one device at a time, BTI-018 can transmit to pair to two Bluetooth headphones, speakers, or soundbars simultaneously as Transmitter. In RX, You can pair two smartphones (or tablets) to this receiver at once. Please note that BTI-018 only supports SBC when paired with two devices simultaneously. 【Auto-Reconnection & 18 Hours Extra-Long Playtime】- DIGMALL 2-in-1 Bluetooth aux adapter supports 18 hours continuously wireless audio streaming time and automatically re-pair with the last paired device. It can work even while in charging! 【What You Get】- DIGMALL 30-day money back guarantee & 24-month warranty, professional customer service. Package includes 1x DIGMALL BTI-018 Bluetooth Adapter 2-IN-1,1x Micro USB Charging Cable,1x 3.5mm Audio Cable, 1 x RCA Cable,1 x User Manual. If you have any questions about this product by DIGMALL, contact us by completing and submitting the form below. If you are looking for a specif part number, please include it with your message.